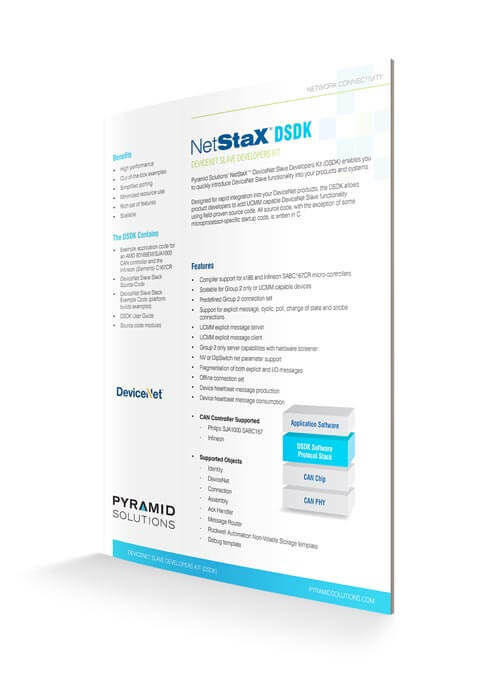 Add scalable DeviceNet™ Slave (server) functionality to your products with our NetStaX™ DSDK. This field-proven source code rapidly integrates into your product and includes documentation and example application code for a Hitachi H8S with an SJA1000 CAN Controller, AMD 80188EM with an SJA1000 CAN controller and Infineon (Siemens) C167CR with an internal CAN controller. All source code, with the exception of some microprocessor-specific startup example code, is in ‘C’ language.